"Freedom is the right of all sentient beings." Profile: Sage, scholar, soldier - Optimus Prime is all this and more. To peace-loving beings across the galaxy the revered leader of the Autobots is the living symbol of freedom - a beacon that shines against the forces of darkness. To his followers he is a bottomless well of inspiration and courage from which they draw their strength. And to the evil Decepticons he is the one force in the universe who can shatter their dreams of galactic conquest. He has dedicated his existence to the protection of all life forms - mechanical, organic and otherwise. His wisdom and compassion are legendary. Although fate has set his course on a path of destruction and strife, his greatest desire is to bring peace and harmony to all inhabited worlds everywhere. Optimus Prime is binary-bonded to Hi Q, a humanoid whose genius in computer programming and design was renowned on his home planet of Nebulos. There he ran the Hi Q Industrial Research Complex, a facility that produced many of the technological innovations that had, over the past few decades, dramatically improved the quality of life for his people. While trying to help several Autobots rebuild Optimus Prime, he made the decision to join the Autobots and defend Nebulos against a Decepticon attack. 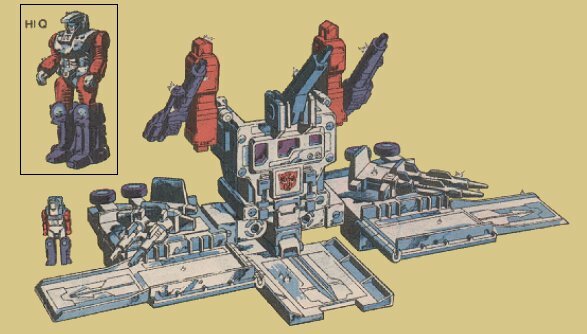 To do so, he and several of his employees underwent The Powermaster Process, which, through bio-engineering, gave them the ability to transform into the engines that their Autobot partners required to power their fight against the Decepticons. Hi Q was paired with Optimus Prime. So far their collaborative efforts have met with great success. 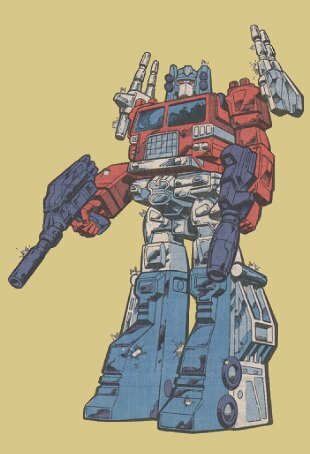 Abilities: Optimus Prime is the strongest and most intelligent of all the Autobots. His strategic, logic and programming skills have no equal among Transformers. He splits into three modules: robot, auxiliary and battle station. 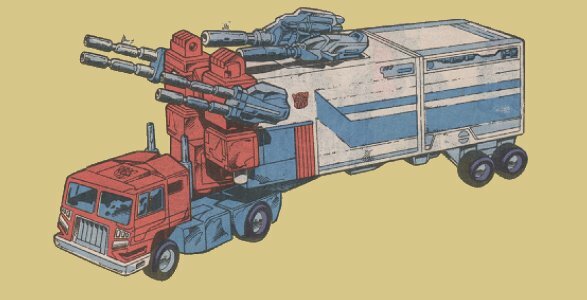 The van portion of his trailer truck mode transforms into the robot or "Optimus" module, which is the part of him that is sentient and is most commonly referred to as Optimus Prime. In this mode he can lift 4,000,000 pounds and exert a force of 12,000 pounds per square inch with a single punch. He carries a laser rifle with which he can burn a hole in the nose cone of a Decepticon jet at a distance of 30 miles. And with his outstanding visual acuity, he rarely misses. His auxiliary or "Prime" module is a small cart-shaped device that he stores in his trailer portion and occasionally uses to sneak behind enemy lines for reconnaissance purposes. He can maintain radio control over it within a 1200-mile radius. Having his auxiliary unit in the field is like being there himself. The trailer portion of his truck turns into his battle station module, which also serves as an armed fortress. It is equipped with two concussion blasters, two twin particle beam cannons, an auto-launcher that shoots a variety of artillery and radiation beam weapons, and a landing platform. An antenna within the battle station allows Optimus Prime to control it and also to maintain a radio link to all Autobots within a 50-mile radius. The antenna can be adapted to a satellite hookup, which provides a tenfold increase in its effective range. In robot mode he can combine with his trailer module and more than double his size and quadruple his strength. Traditionally, the elders of the Transformer race have bestowed upon an individual of great courage and wisdom the Creation Matrix, an intricate program encoded in light patterns within a crystal. The Matrix grants its bearer the amazing ability to help create new Transformer life within the lifeless shell of a newly constructed Transformer body. Since the beginning of the Autobot-Decepticon war, an Autobot commander has typically possessed the Matrix. The most recent Autobot leader to be so honored was Optimus Prime. 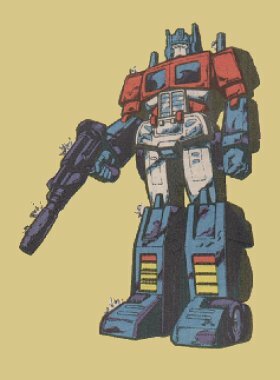 Weaknesses: Although Optimus Prime can function as three separate modules, injury to any one of them is felt by the other two. The auxiliary unit is particularly vulnerable. However, the Optimus module is by far the most important unit of the trio. Although he could survive without the other two, they could not survive without him. Otherwise, the only weakness he could be accused of having is compassion and concern for the safety of others. He would be a more effective military commander if he were more ruthless, but then he wouldn't be Optimus Prime.